Making a Difference one youth at a time. Mentor and Me: a highly structured, evidenced-based mentoring initiative that combines group and individual mentoring to achieve academic, socio-behavioral, and pro-social goals. GRYD: The Gang Reduction and Youth Development Program is a comprehensive, is a whole family prevention strategy. Its purpose is to address and minimize the effects of risk factors that contribute most to youth joining gangs, engaging in violence, dropping out of school or engaging in delinquency. The objective of the program is to change attitudes, behaviors and beliefs favoring gang culture and promoting these risk factors to those more aligned with social norms. In this way, the program seeks to transition youth such that they will ultimately have the maximum opportunity to succeed in school and in life. This partnership with the Mayor’s Office seeks to achieve favorable outcomes in high-risk youth through mental health, remedial education, socio-behavioral, healthy lifestyles and parent/family engagement interventions. Brother to Brother Male by Birth, Man by Choice: a uniquely designed mentoring program for men and boys of color that facilitates the development of safety and accountability networks that build trust, improve community quality of life and eventually affect policy and systems change. Through a series of community and civic engagement outings, mentoring activities, social outings, and empowerment trainings, Brother to Brother changes the social isolates that stagnate the growth and development of South Los Angeles men and boys of color. The Futures Without Violence Coaching Boys into Men curriculum (which teaches youth about domestic violence and respect of women), the California Community Foundation BLOOM & PAT programs, and the Ethical Leadership in Local Communities model are featured in this program. March to 1000 and the SES (Supplemental Educational Services) Programs: March to 1000 and SES are highly intensive remedial education programs that use an effective combination of experiential and hands-on, alternative assessment, computer-assisted and traditional classroom instruction as well as real-time evaluation, tracking and monitoring to address content standard-specific learning gaps; thereby significantly improving academic performance. BioFuture STEM (Science, Technology, Engineering and Math) Education Initiative: BioFuture is a three-prong STEM education initiative that uses innovative and engaging hands-on experiential learning to interest students in STEM-based disciplines; provides training and support to STEM educators who may need assistance in making their instruction more engaging; and engages parents as support matriarchs to help facilitate a connectivity with students and STEM disciplines. 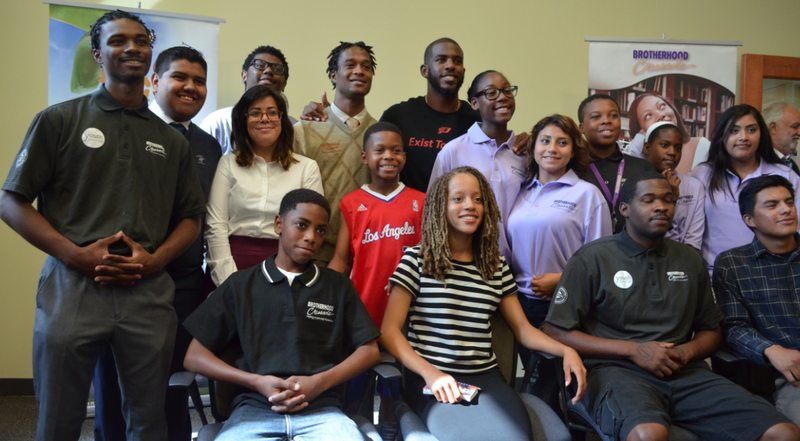 BioFuture targets underperforming South Los Angeles youth, their parents, and their STEM teachers. Honda Foundation, Raytheon, Boeing, Verizon, Microsoft, the California Consumer Protection Foundation and Zeta Rho Foundation all support this effort. Scholastic Sports Experience: The Scholastic Sports Experience is an educationally focused mentoring, character development (life skills), anti-obesity and violence reduction initiative designed to effect positive social change by addressing low academic performance, poor decision-making skills, low self-esteem, physical fitness, nutrition education and poor life & social skills among low-income 5 – 18 year old African-American and Latino youth in South Los Angeles. As a significant consequence of being a participant, youth perform better in school, expand their world-views, increase self-esteem and maximize their opportunities to succeed in school and in life. The U.S. Soccer Foundation, The California Endowment, Leon Lowenstein Foundation, California Community Foundation, Nestle and Laureus Sport for Good Foundation support this initiative. Jr. Executive Leadership Program: The Jr. Executive Program prepares teens for work readiness, career development, and entrepreneurship through hands-on experiences and vocational life skills development. The goal is to inspire and prepare young people to succeed in the real career world. Accordingly, teens who want the opportunity, are ready to accept the responsibility, and are committed to enter the workforce or business world are recruited, trained, coached and supported. Teens learn the dynamics of work responsibility and accountability while developing new skills needed in the global marketplace. Corporate exposure, advanced financial education, internships, entrepreneurial development, personal code of conduct, job placement, and ethics are critical components of the program. In addition to evaluating and measuring the program goals, objectives and desired outcomes, each participant is also given a pre- and post-vocational aptitude assessment that measures their skills, abilities, attitude, interests, and achievements. The Jr. Executive Leadership Program is made possible by the Microsoft Elevate America Initiative with generous mentoring support from other corporate partners. Teaching Gardens: Teaching Gardens was created to educate students about the importance of fruits and vegetables, energize and excite them about produce, and introduce fresh produce into the diets of students and their families. Participating in the Teaching Gardens Program gives schools access to a variety of resources and support to help achieve these goals. This is a Brotherhood Crusade partnership with the American Heart Association, Jaime Oliver Foundation, LA’s Promise, LAUSD and The California Endowment. Preparing Achievers for Tomorrow: A sports-based youth of color development initiative in partnership with the California Community Foundation and the U.S. Soccer Foundation, PAT targets high school-aged students and is designed to effect positive social change by addressing low academic performance, poor decision-making skills, low self-esteem, physical fitness, nutrition education and poor life & social skills. South Los Angeles Youth Council: This paid council of South Los Angeles youth from all walks of life looks at the challenges and issues facing their peers, families and communities and seeks to find viable solutions to address them. Convened by Peace Over Violence and further supported by the Microsoft Elevate America Initiative and The California Endowment, the council is supported by numerous members of the South Los Angeles Building Healthy Communities collaborative. Engaging Men: A theatrical social awareness initiative around domestic, dating and gender-based violence as well as sexual assault, this project seeks to engage men in the prevention of these social ills. Twenty youth are hired for one year to learn all forms of theatre arts from Wendy Raquel Robinson (Amazing Grace Conservatory) and develop a social message presentation. This partnership with Los Angeles Child Guidance and Peace Over Violence is supported by the U.S. Office of Violence Against Women and Microsoft Elevate America Initiative. Boys and Men of Color: Also referred to as the Brother, Sons and Selves Initiative, this project convenes boys and men of color from Boyle Heights, Long Beach and South Los Angeles to research, discuss and offer viable alternatives to the challenges confronting boys and men of color. These communitywide efforts are further tied to statewide efforts to change policy and systems that serve to negatively and disproportionately impact boys and men of color. The project was initiated by The California Endowment and is convened by Liberty Hill Foundation. BLOOM (Building a Lifetime of Options and Opportunities for Men): BLOOM is a partnership with the community of South Los Angeles to improve educational and employment opportunities for 14-18 year old Black males who are, or have been, involved in the county probation system. Begun by the California Community Foundation, BLOOM increases leadership and career-based mentoring opportunities for Black male youth while addressing policies that lead to chronic involvement with the judicial system and reshaping public perception of Black male youth. Youth Source Center: The Brotherhood Crusade Youth Source Center is a partnership with the Los Angeles Community Development Department, Comerica Bank, Microsoft Elevate America Initiative and the community of South Los Angeles to improve educational and employment opportunities for 14-21 year old South Los Angeles youth who are unemployed and out of school or at-risk of dropping out of school. The program increases educational and career-based mentoring opportunities by aligning youth with committed mentors, re-engaging youth in school, developing their vocational life and social skills, improving their academic skills, engaging youth in work experience volunteerism and internships, and eventually helping youth secure employment. Restorative Justice Teen Courts: Brotherhood Crusade developed its restorative justice teen courts to provide effective disciplinary alternatives to suspensions, expulsions and other non-supportive forms of punishment within South Los Angeles schools that perpetuate school push-out and fuel the school-to-prison pipeline; increase stakeholder awareness around issues of suspension for defiance (non-violent but disruptive behaviors that arguably do not merit the extremity of suspension); and affect school wide policy that currently enables the disproportionate suspension of low-income students and students of color. The model uses restorative and transformative justice principles as alternatives to traditional school discipline. Ultimately, the goal of restorative justice teen courts is to systematically transform school discipline policy in LAUSD and simultaneously effectuate the implementation of School-Wide Positive Behavior Support in all LAUSD schools. Golf Mentoring: Working with the Advocates, an organization of well-accomplished and considerably committed Black professional men who deeply care about the future of young Black men and enjoy golf, Brotherhood Crusade provides career-based mentoring and golf programming. Taking Financial Control Money Management Program: This innovative program teaches 15 – 19 year old youth to save 50% or more of every dollar they earn or obtain and features an Individual Development Account element that allows them to receive a 2 to 1 match on every dollar they save ($1,000 saved is matched with $2,000; bringing their total savings to $3,000.00). As a requisite part of their program, youth must attend financial literacy training and investment club meetings on a monthly basis. Business Computer Training Program: conducted in partnership with the Microsoft Unlimited Potential Partnership program, this opportunity serves both to increase access to technology and simultaneously seamlessly transition hard-to-serve populations into good-paying information technology (IT) careers. The latter purpose is an extension of the Vocational Training and Career-Path Program. The IT curriculum involves instruction in hardware and software provided by a certificated, bilingual instructor. Technology Access Program: Brotherhood Crusade provides free Internet access; and convenient, fee-free Internet access instruction to low- to moderate-income South Los Angeles residents. Additionally, Brotherhood is working to launch an initiative to facilitate and provide online anytime, anywhere academic instruction and vocational training for individuals whose circumstances restrict their ability to access traditional services. 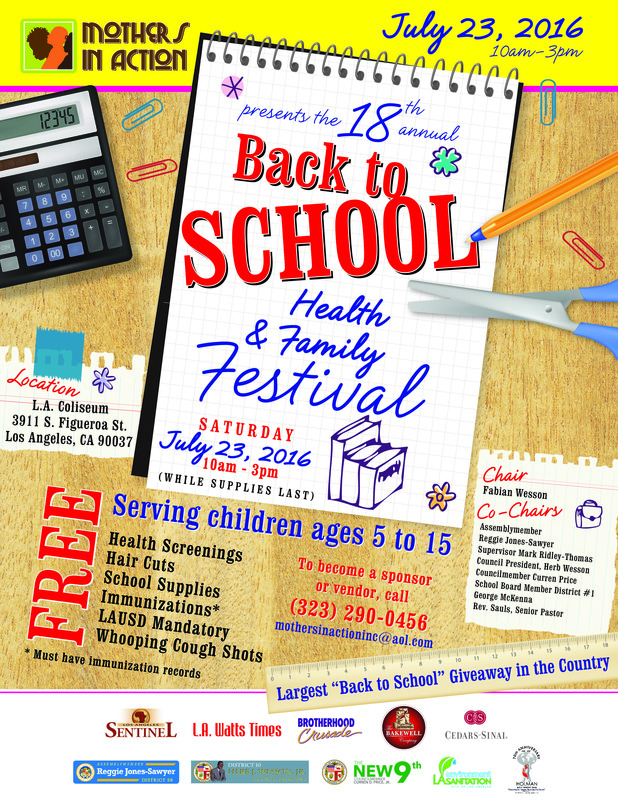 Annual Back to School Event and Health Festival: Each year Brotherhood Crusade anticipates serving more than 10,000 youth; providing them with dental screening and care products (Colgate-Palmolive), free haircuts, health and nutrition education, health screenings, resource and referral services, and school supplies (Avery-Denison and Wal-Mart). Friends Serving Friends Homeless Feed and Health Festival: Each year, Brotherhood Crusade serves more than 4,500 children and adults at the homeless feed. More importantly, upwards to 1000 homeless individuals were screened for possible health ailments that otherwise would not have had an opportunity to be screened. Brotherhood Crusade Jim Cleamons Books and Basketball Camp:One of the most anticipated weeks of the year, the Books and Basketball Camp features a week of instruction in math and science (California Science Center), financial literacy (Wells Fargo and Washington Mutual), social development, personal development, health and nutrition, and, of course, basketball. Los Angeles Lakers Assistant Coach Jim Cleamons and ABA/NBA legend James Jones are joined by a host of former and current NBA players in bringing this fee-free camp to life. The 2009 camp provided services to youth of varying backgrounds including some sent from the Los Angeles County Probation Department. Soccer for Success: An after-school program for youths 5-18 offers soccer instruction with an emphasis on social skills, health and nutrition education, and mentoring. The program aims at engaging children in a minimum of 200 minutes of moderate to vigorous physical activity per week. There are no eligibility restrictions or fee; Soccer for Success has a no-cut policy and is inclusive of high‐risk youth and those with mild disabilities. All equipment needed to play, along with nutritional snacks, is provided.